KENTUCKY Blue Grass man Alex Zwarts is worried the Bundaberg Regional Council may force him to sell his beloved birds and demolish the aviaries he's had in his backyard for more than 25 years. 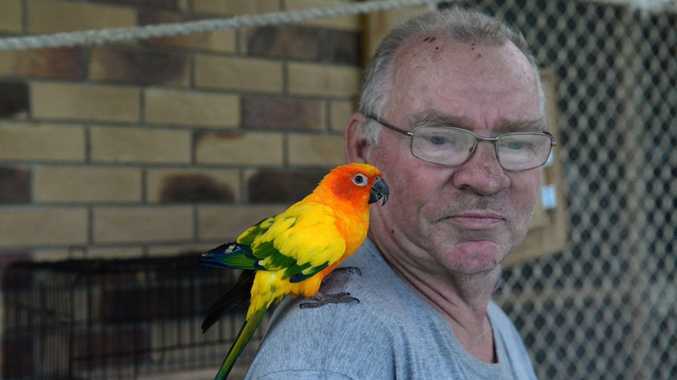 Mr Zwarts is a bird breeder; he has 150 Indian ringneck, conure's, cockatiels and budgies at his Phar Lap Pde home. But Mr Zwarts said the council have told him his homemade bird cages require council approval within four weeks. Mr Zwarts said the issue came to the council's attention after an officer inspected his property following a complaint from a neighbour on an unrelated matter. "What happened was, my neighbour was complaining about the horses and alpacas," he said. "The council came out and he said the horses are alright and alpacas are okay but you might need something for your bird aviary." The councils Planning and Development spokesman Ross Sommerfeld confirmed the inspection was "driven by public complaint". Cr Sommerfeld said the council was investigating the aviaries for safety and compliance under the Building Act. "Structural and other related matters are being assessed at this stage," Cr Sommerfeld said. "Our discussions are ongoing with Mr Zwarts and council views this interaction as confidential." Mr Zwarts said he's had the aviaries for 25 years and just renovated the oldest one. "But now they sent me a letter that I need a structure permit for bird aviaries," he said. "I've got plenty of friends who have got heaps of aviaries more than me and nobody has a permit for bird aviaries." Mr Zwarts said he needed a private certifier to check the aviaries. "I went there yesterday and he (the certifier) said if you were in Hervey Bay you'd have no problems," he said. "But as soon as you come past Woodgate and you get the Bundaberg Regional Council (area), you get all these problems." Mr Zwarts believed the certifier needed to issue him with certificate that he would then need to supply to the council. "And I may need an engineer to also make a drawing of the bird aviaries," he said. "It looks to be very strange that this council is making a problem over bird aviaries." Comment: Has minority drowned out majority?